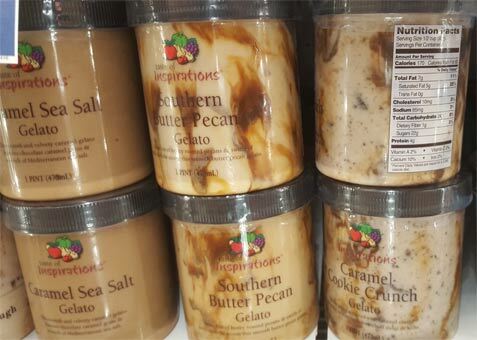 On Second Scoop: Ice Cream Reviews: Would you try Peach Guava Gelato? Would you try Peach Guava Gelato? So who out there shops at Big Y? We happened to be in Connecticut briefly and as always, I couldn't resist a tour of the freezer aisle. I saw a few neat things like the new Humboldt pints, High Road ice cream, Vice Cream and even local players Shady Glen and The Farmer's Cow. 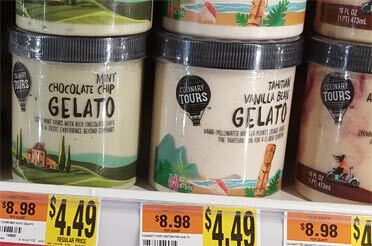 What caught my attention more than anything though were these cleverly labeled gelato pints. Now the name "Culinary Tours" sounds very much like a store brand masquerading as a fancy brand. I'm mad at myself for not grabbing a picture of the backside of the pint, but in my defense, I did have a small boy pulling my arm to hurry me along (he loves shopping but just wasn't in the mood for more than five minutes of it today). There were seven flavors in all but I'll list the most interesting one first. I've mentioned before that you need to keep an eye out for these kinds of brands because amongst the classic flavors will always be lurking something from out of left field. Peach Guava - luscious Ecuadorian guava teams up with juicy peach. So, if you shop at Big Y, is Culinary Tours a regular brand? and have you tried it? For the rest of you, how does Peach Guava gelato sound to it? When I do a quick google search, peach guava and strawberry guava both come up as flavor combos so maybe you've had something similar before? Share your thoughts in the comments. 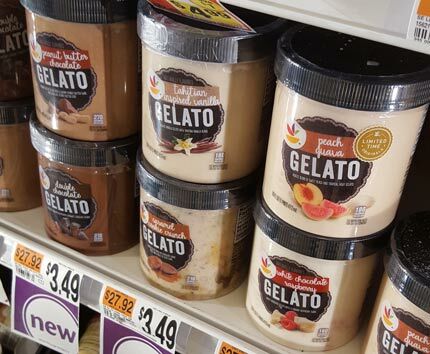 Stop & Shop (GIANT) Update: Same container and matching flavors. In the industry, we call that "not a coincidence" . Not sure why just the peach guava says "limited time originals". You may have noticed it's also a dollar cheap but that Big Y store was pretty expensive on everything. Second Update: Both of these products have a big GS GELATO stamped on the bottom, which is ironic because we've had good luck with them on the blog but I'm not sure this gelato lives up to their standards.... stay tuned for more details. Third Update: Food Lion (Hannaford) has them too. Taste of Inspirations Gelato. Caramel Sea Salt, Southern Butter Pecan, and Caramel Cookie Crunch... so basically they named them after the Talenti versions. I live in NJ so I have never heard of the brand before, but the peach guava sounds good to me. I've had drinks and hard candies of that variety and it's sweet and delicious! Yes those flavors sound great! Wish I could get them in Virginia. Don't normally shop at big Y, but I'm gonna try the candied pecan and peach guava. Love me some praline pecans and theres never enough fruit flavored ice cream options. Farmer's Cow is 10/10 and THE best cookies & cream ice cream but IMO you're better off visiting their "Calfe" for their pints or scoops because it seems like the pints I've gotten at StopNShop tend to have freezer burn. Wow, I JUST saw these at Stop and Shop today, and even posted them on Instagram! I'm going to try them soon. Peach and Guava are flavors that work better as sorbets, but I'd be willing to try them in a gelato. A little late on this one, but we have the items posted on the original post in local stores in Minnesota. Stores that don't have "store brands". The Big Y ones at least are Topco Associates. And that last one is amaretto with Amarena Cherries. It was excellent. You should be able to get them at Food City if you have one in your city. Our Food City in TN carries the Culinary Tours brand. I bought a pint of Culinary Tours Espresso Chocolate Chunk Gelato from the local Big Y store on Sept 5. To be clear, it was disgusting! It tasted like and had the texture of cheap ice milk. The chocolate chunks were not chunks; merely small chocolate chips. The espresso and chocolate flavors were weak. I read the ingredients list and found a high coconut oil content -- a totally wrong approach to making good gelato or ice cream! To say I was disappointed is a gross understatement. We ate less than half, and trashed the remainder. I have saved the container and the receipt to obtain a refund. To call this product a gelato is a lie. I live in Southern California and just recently came across the Culinary Tours brand. They have Mexican style frozen fruit bars called paletas that come in a Caribbean Mix flavor which is strawberry, pineapple, mango, passion fruit with coconut flakes. They are sooo good. 90 calories a bar- Zero fat. Also noticed today they carry a frozen entree/side dishes with quinoa. Haven't tried any of thoses yet but am curious what else is their line. I live in Buffalo, NY and I accidentally bought this brand when I was getting my Talenti (this off brand snuck into my cart!). I ended up with "Culinary Tours" Amaretto with Amarena Cherries, and, in a word, it was disgusting. The texture is probably the worst thing. It has a grittiness to it that I have never experienced in any gelato or ice cream ever. The flavor... was also not great. It has an aftertaste that I can't put my finger on but is not pleasant. One of the ingredients is vegetable fiber and I think that might be what is responsible for the texture and flavor being off. Needless to say I won't be trying any of their other flavors and I will be more careful when picking up my pints in the future! I came across this post because I purchased 2 pints of Culinary Tours "Super Premium" Ice Cream at the Big Y and they were excellent but I can't find them now. I have a photo I wish I could post. The flavors were Strawberry Chocolaty Chunk and Double Cookie Dough.